Your engine needs plenty of clean air, so regular filter changes will keep your 300C’s performance and mpg at its best. Fits Saloon and Tourer models. Oil filters for the 300C diesel and petrol engine models. Fits Saloon and Tourer models. Fuel filter for the 3.0 CRD Chrysler 300C. Fits 3.0 litre CRD 2006-2010. Air conditioning pollen/dust cabin filter for the 300C. Filter and gasket set for the 3.0 CRD automatic gearbox. Fits all 300C automatic models. 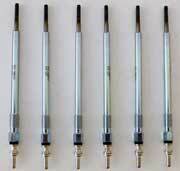 Dipstick to check the fluid level in 300C gearboxes. It is used for checking only and not designed to be permanently left in place. Instructions for reading the levels are included. Fits all Chrysler 300C models. 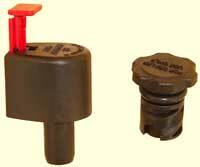 This specially shaped plug is essential to seal the dipstick tube of the automatic gearbox. Oil leaks from the auto gearbox are most commonly from the wiring plug connector. This direct replacement connector is made from an upgraded heat-resistant plastic to prevent further oil leaks due to brittleness and cracking. Includes the necessary rubber O rings. 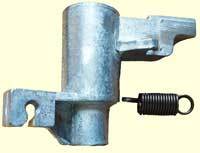 If the Auto gearbox will not move out of PARK then the cause is usually due to a faulty interlock latch. It is only made of plastic and is prone to breaking. This upgraded latch solves the problem as it has been re-engineered in metal for a long life. See the video below. 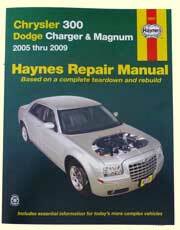 Very useful repair / maintenance manual for the 300/300C. It covers the 2.7, 3.5 & 5.7 litre models. Unfortunately, at present, there is no manual available specifically for the 3.0 diesel. However, apart from the engine and gearbox, the diesel 300C is virtually identical to the petrol versions - sharing the same steering, suspension, brakes, steering, interior and exterior for example.